Since Rodney’s back injury [Daddy Dearest] is directly under the front pressure point of a theoretical saddle, I continue to poke away at the accumulated scar tissue. Weekday therapy is heat [Therapy] and massage. On the weekends, Hubby flexes his he-man fingers of strength to break up adhesions. When we brought Rodney in Saturday night, he had a small damp spot on his back right over his scar. Medical opinion is that we broke open some sort of small cyst, sinus, fluid-filled cavity. We have no idea what structures (skin, muscle, nerves) were involved, if it was causing him any distress, or if it had any relation to the scarring at all. Still, better out that in, no? 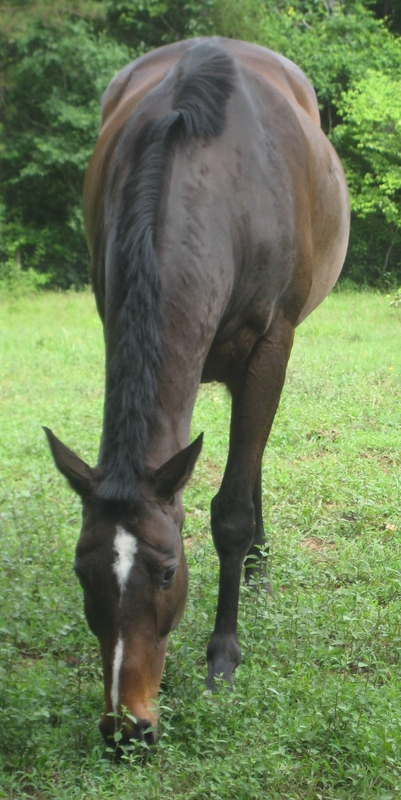 The next day, Rodney did a lot of happy trotting and cantering as he moved from place to place. No way to tell if the cavorting was from improved movement in his back or from joie de vivre on a breezy day. The increments of change are so small that they are easy to confuse with wishful thinking. Let’s keep our fingers crossed that he was feeling better!